Before I left for vacation last week, I visited my grandmother to tell her about my upcoming trip. She is 96 and hasn’t been back to the Caribbean for almost 20 years now, but her memories of time spent in the West Indies are among her most cherished, and she happily recounted many of them for me. She pointed to two slim, plain gold bangles on her wrist and said proudly that she has had them since she was thirteen, when her parents brought them back from a cruise down to the leeward islands. Above: My grandmother Hope (or her twin sister, Kate, we never can quite tell), in Vermont, 1932, displaying a gold bracelet about her wrist. It became tradition for Mumma and her sisters to buy bracelets each time they returned to the islands, and ever since I was a child, I can recall a gentle clinking sound following her as she moved about the house. She’s passed this style on to the younger generations of Goddard women too: my mom, aunts and older cousins all tend to jingle merrily while they gesture or hug. Since this would be my second trip to the West Indies and only a week before my 25th birthday, I thought I would at least investigate the possibility of buying one for myself in Antigua, which led me to many frustrating pre-trip google searches in which I came up with almost no information, either commercial or historical, on the subject. This had the effect of peaking my curiosity ENORMOUSLY. Where did these magical, beautiful creations come from, and who were their makers? My experience studying the effects of tourism on local economies during my semester with S.E.A. (not to mention LIVING in a tourist economy in Newport) has left me with a jaded view of shopping in vacation hot spots. All too often, it seems that the pressures of a global economy and mechanized production of goods puts artists and craftspeople the world over up against prices that are hard to beat. Moreover, tourists who don’t know any better (and tourists who do), buy these cheap items without considering that they may have been made 5,000 miles away, and thereby perpetuate this cycle of artisan displacement. My fear was that the Caribbean of my Grandmother’s recollections, and the artists that she seemed to find on so many occasions with ease, may not have been able to stand up to these challenges, but I was resolved to find out. Imagine my delight when I noticed, upon arriving, that the Antiguan customs official who took my passport was wearing bangles just like Mumma’s, and then picture me nearly jumping for joy and motioning enthusiastically to Tom each time a woman passed us in the supermarket with a little tinkering sound. I finally described them to a woman in a clothing shop, and she nodded and said, “ohhh, you’re looking for those old-timey bracelets. I know what your talking about, I’m a jewelry expert!” (her coworker started giggling). She referred me to a store on the cruise ship piers of St. Johns, and somewhere between the cases of duty-free, fancy European label diamonds within, there they were! My bangles! I excitedly started questioning the young sales woman about where they came from; were they from the island, and could she tell me who made them? She didn’t really have any information to give, other than that locally, they are referred to as ‘Caribbean Bracelets.’ Slightly disappointed, I decided to continue my search in the hopes that it would still be possible to buy directly from an artist. Mumma grew extremely close with an Antiguan family during winters spent with my grandfather there, and she eventually became godmother to two of the children, who I had the tremendous pleasure of meeting for the first time last week. In addition to sharing all sorts of stories about ‘hope mummy’ and their many escapades together, Feona knew exactly what I was talking about when I mentioned the bracelets; it turned out that Feona’s uncle made them for my grandmother, and his son, BJ, continues the family tradition today. 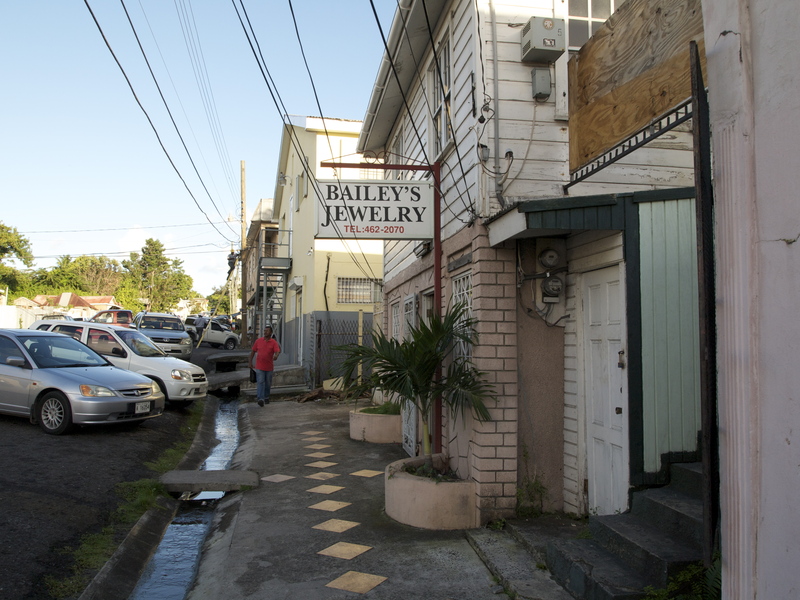 I walked in the door of Bailey’s Jewelry in Antigua’s capital city of St. John’s and was greeted by the zip! 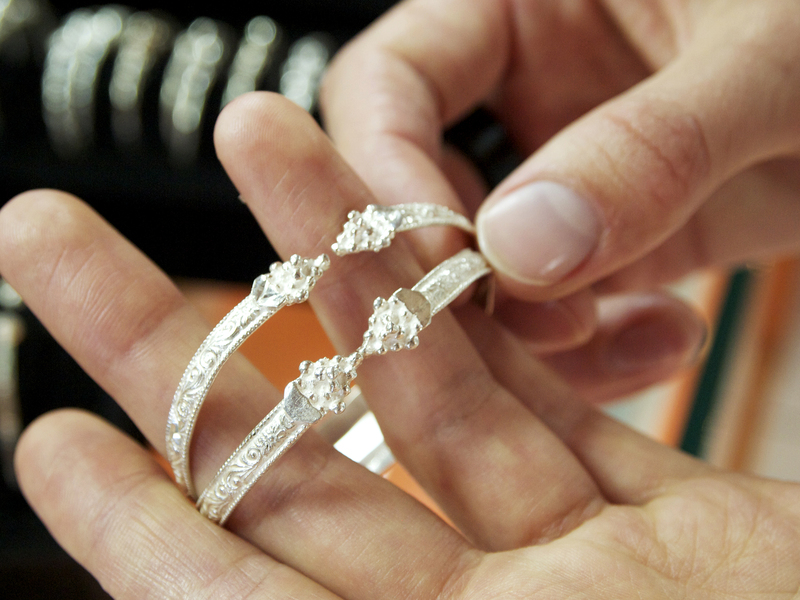 of jewelry saws and the whoosh! of welding torches emanating from the back room; I knew I was in the right place. The bangles on display were all in silver, and I was informed that certain designs were made by BJ, others came from Trinidad, and all could be custom made in gold. 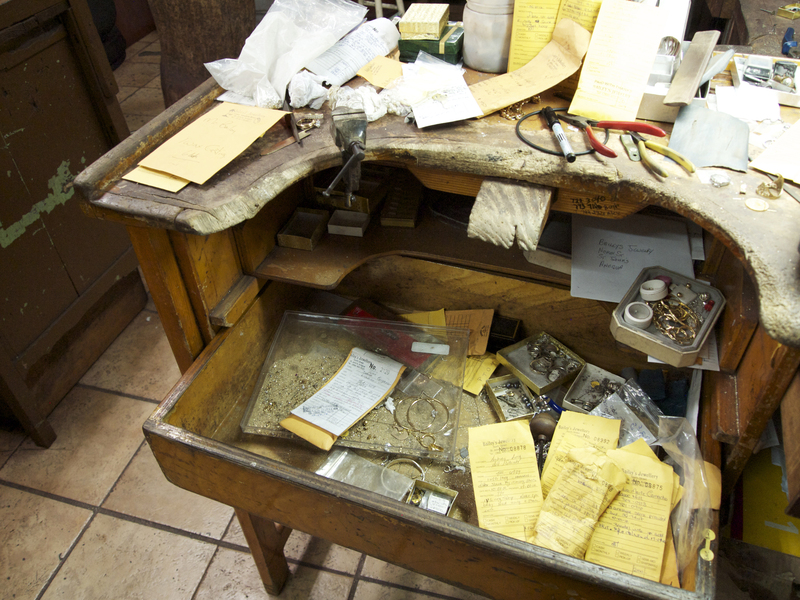 Then in walked the jeweler himself, and a history lesson far better than I could have hoped for began. Above Top: A bangle made by BJ Bailey featuring a highly ornate, cone-shaped head and hand chiseled designs around the body. Above Bottom: A bracelet made in Trinidad of its own distinct style. 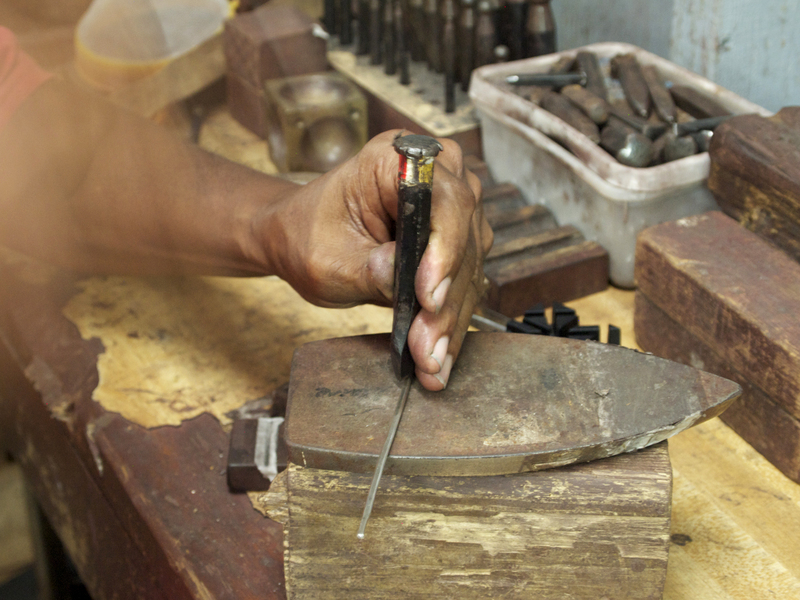 BJ’s father learned fine metal smithing techniques from an English minister who came to preside over St. Paul’s Church in Falmouth, Antigua in the 1920’s. 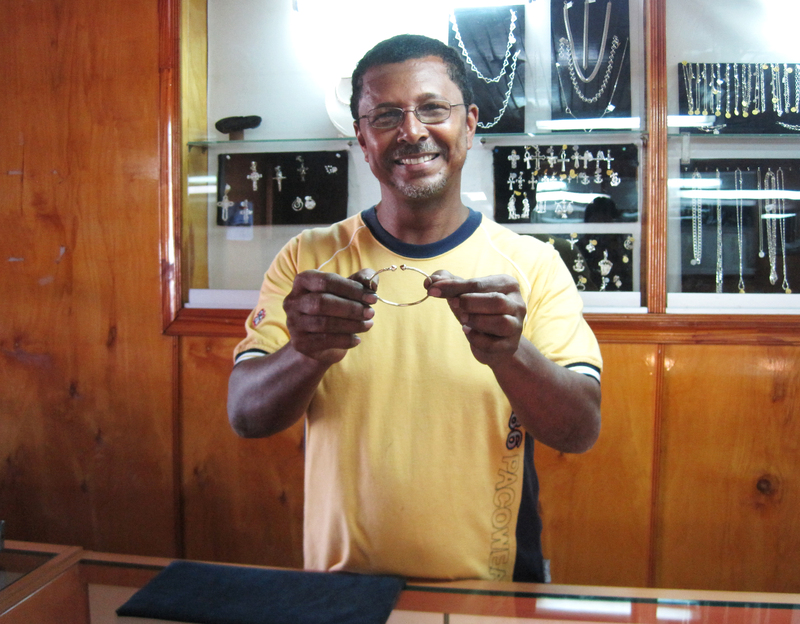 This minister taught a small group of locals what he knew, and from there, they each developed unique bracelet, wedding band and hoop earring designs that were in demand by locals and tourists alike. BJ learned the trade from his father, and continues to use many of the tools and furnishings that were passed down to him. He told us with great pride that his bracelets are completely hand made, and that in fact, no machine or mold could ever replicate the artistry and delicacy of his designs, and then he took us back into the workshop and started melting stuff! 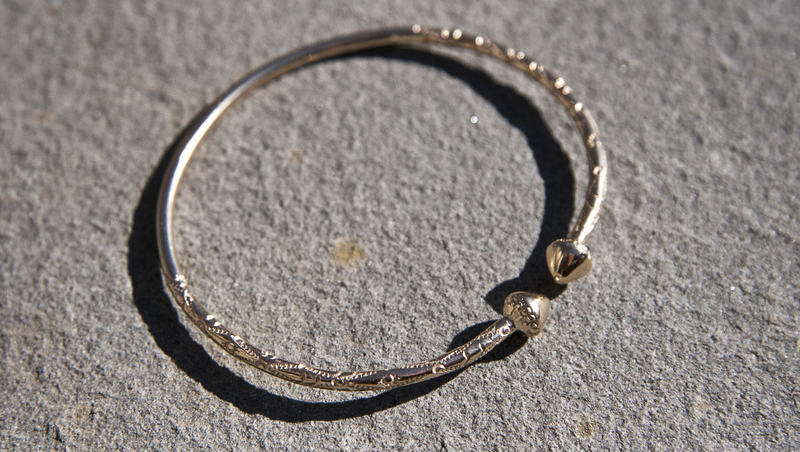 Above: Every bangle, whether gold or silver, begins it’s life this way. BJ buys his raw material in small nuggets. 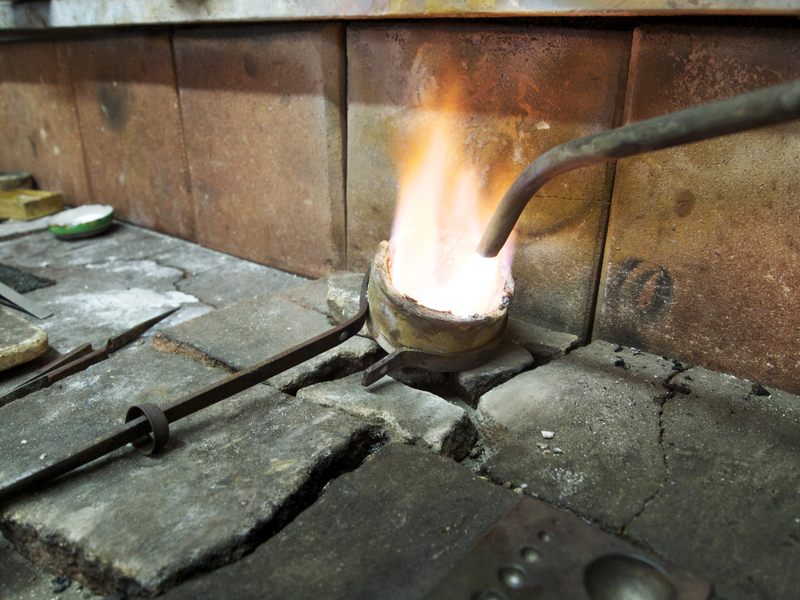 Below: The metal is melted down in a crucible using an acetylene torch. 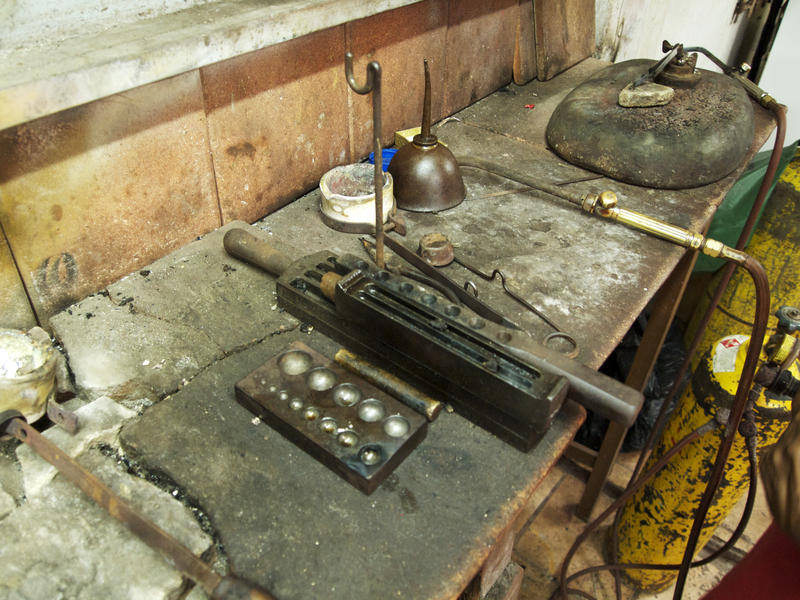 Above: The molten metal is poured into one of these ingot molds to roughly form a bar or ball shape as needed. 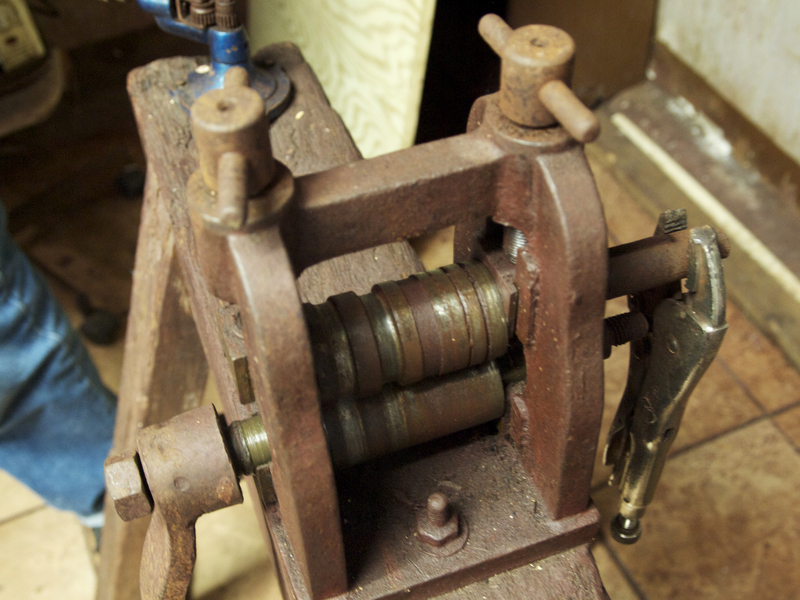 Below: To form the body of the bracelet, the oblong ingot is repeatedly run through a series of hand-cranked mills which pull and press it into shape, first as a long square rod, and then as a perfectly round wire. The green mill is a more modern version of the one used in BJ’s father’s day, pictured second below. Above: BJ rounds out the shaft by cranking it through an iron die. 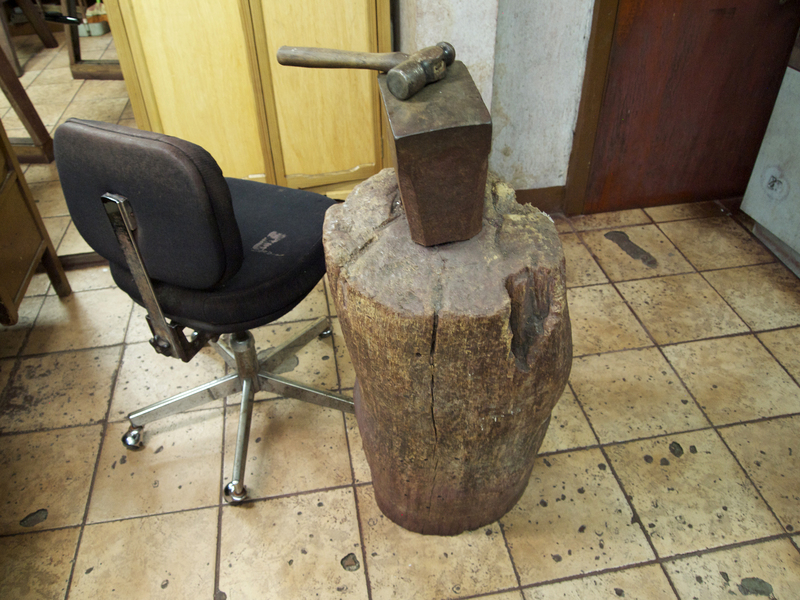 Below: In order to prevent wear on the holes of the die, sharp edges are often softened on this anvil first, which is over 100 years old. 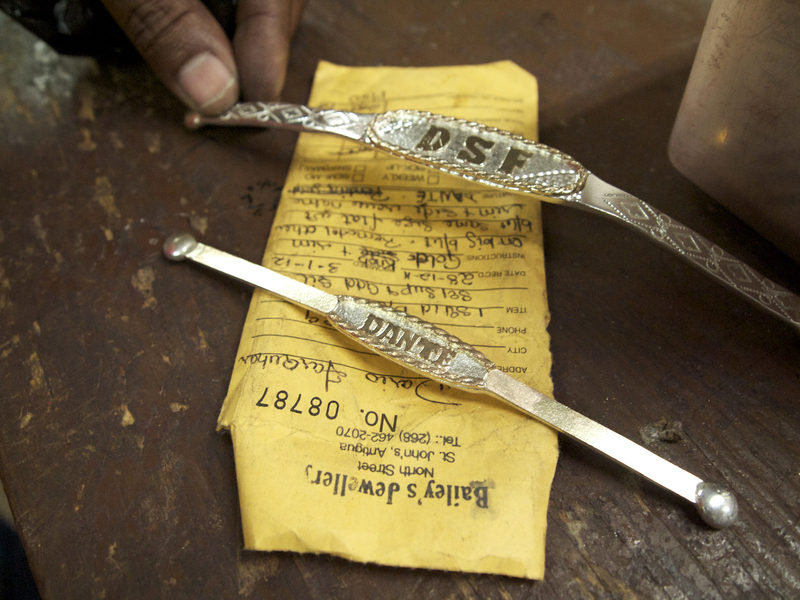 Above: Once the heads are welded on and the piece polished, the bangle is ready for its ornamentation. Below: Each design is hand hammered using chisels with varying patterns on the tips, and finally it is bent around a mandrel. Every bangle’s pattern is crafted with a careful eye and is an expression of the artist’s whimsy. 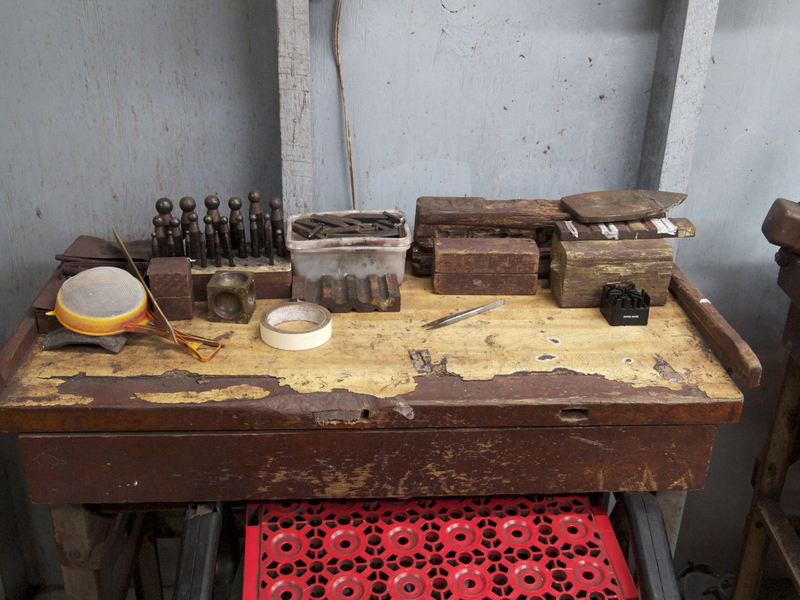 Below: There was a strong sense of continuity in the shop, from the well-worn tools (they never make them like they used to) to the desks which had been there since before BJ was born, such as this one. 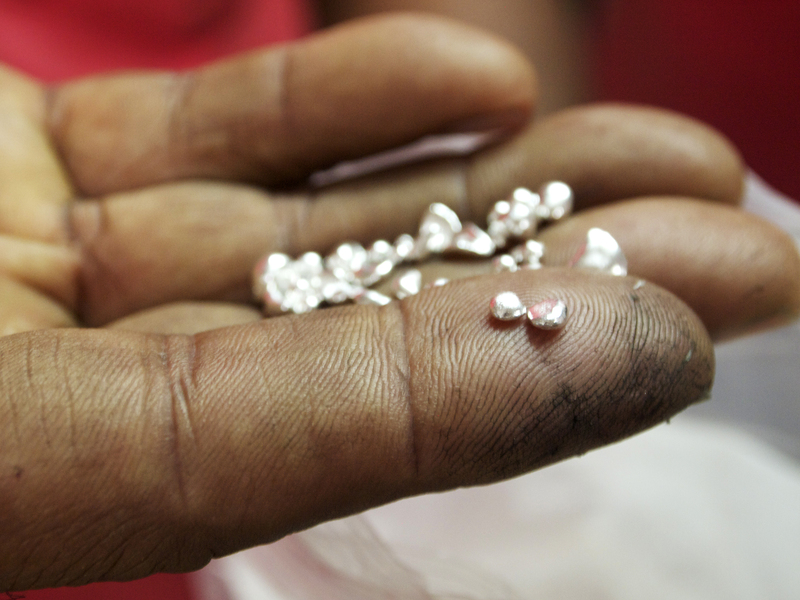 Below Second: These works in progress reflect a more modern trend that I noticed on a lot of young Antiguans, especially men, which is both gold and silver and features a complex, chiseled diamond pattern around the initials. I even met a 9 month old baby (Feona’s grandson) with the teeniest name bracelet imaginable! The day after my visit, BJ presented me with my very own, hot-off-the-press gold bangle, a big hug, and instructions on the proper way to take it on and off. I skipped out of the store relishing the sound it made upon meeting my other bracelets (acquired on travels past) and couldn’t stop looking at my wrist. Lately though, I’ve been wearing it on its own, a lone and delicate show-stopper. I suppose, like Mumma, the accumulation of bangles is a journey meant to take me a lifetime of visits to the West Indies, too. The tradition continues :) I have a pair ….previously owned by my late mom! Thank you for visiting, Michelle. I’m glad my article was found by someone else who appreciates how special those bracelets are! It is absolutely delightful to read this piece! I have had several bracelets made by BJ only to lose them all at some point. All of the older ladies in our family wore bracelets made at Bailey’s Jewelry, you could say that it was a matter of pride as each piece was a work of art. Thanks for sharing! Oh I’m so glad to hear that other families share the same tradition as mine. Thank you for stopping by, Giles! I hope that you get to pay BJ a visit sometime soon. I am very surprise and excited to find and read this article. My dad owns the business above BJ’s shop for many years now (Henry’s Customs Brokerage and Services). So my family and I have gotton not just bracelets, but other jewelry as well from there. Got them cleaned and even bought my own cleaning material from there. I Just realized all my years of being in and out of the store, and knowing BJ like family. I never thought to ask the history of him and the store. It’s amazing that I’m now living in Marietta, GA since Nov. 2007 and only NOW I learnt this information. Great article!!!. Seeing the picture of the outside building and my father’s office, along with the tools and benches in BJ’s shop, really takes me back home. Relbert, I am happy you found the article! BJ’s is such a wonderful story that it makes me happy to know that more people are learning of it now! Thank you for this article, I’m BJ’s cousin and was doing a family tree for my Daughter and needed a picture of the shop. This story is awesome and has alot of history and it save me a lond distance call to Antigua again beacuse my dad didn’t give so much details. I’m posting this story on my FB Page for all my nieces,nephew and cousins to share. We all have a bracelet, my daughter ran to get hers after she read the article and she’s presenting to her class as well. I’m so glad you came across the article and that it was helpful to you! I really enjoyed researching it and reconnecting with Feona, Hugh and the rest of the Bailey clan when I was in Antigua last winter. I know my grandmother thinks of them often and with much fondness, though she does not travel anymore (at 97! ), so it was a very special trip for me. All my best to you and your family for the holidays! What a sweet tale, I enjoyed reading this very much. Both my parents are from the Caribbean. Traditionally babies of caribbean parents get custom jewelry from the islands, but my sisters and I received American gold jewelry. My classmates in school who were also West Indian-American all had cool signature pieces that screamed their heritage. You could tell if someone was from Panama,Trinidad, Guyana etc just by looking at their gems. Unfortunately I never got any but I always wanted some. 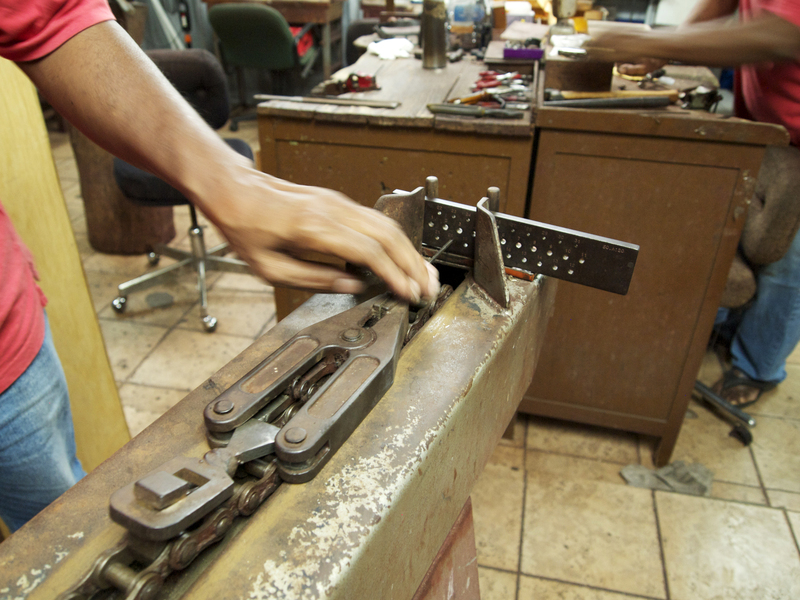 Then one day I stumbled upon some Guyanese jewelers who also make Trinidadian jewelry in Brooklyn, boy was I stoked! I ended up buying a pair of earrings but they were stolen, I am def going to buy lots more. I am glad you enjoyed your travels, hope you are still wearing your treasure. Happy Holidays! i’d love to know where in brooklyn the guyanese jewelers are! it’s 2016 so certainly some time has elapsed since your comment above… but your help would be so appreciated!! What a great article. I am from Antigua, I wear a pair of bangles that my father gave to my mother when they began dating. I never take them off. Both my parents also continue to wear bangles passed down to them through the years when their parents died. It is a wonderful family tradition and I happy that you found what you are looking for. I love your article my uncle got a gold bangle made for me and I absolutely love it. My husband recently got me one for Christmas; he’s Guyanese and many Guyanese women also wear them…love mine and hope you have been enjoying yours! My mother was born in Trinidad and all the women in her family wore a pair of gold bangles. Mom married my dad, an American soldier stationed in Trinidad and then moved to The US in 1947. My 2 sisters and I, aunts, our cousins and now our daughters and their daughters all wear the gold Trinidadian bracelets. It is a beautiful tradition and in family gatherings you will always hear the sweet tinkling song of our bracelets mingled with our laughter. What is the proper way to put on/take off the bracelet? Thanks for this article. I will be sending it to my Aunts. I live in Canada and my Grandma had gold and silver bangles made by a jeweller here when she was younger. She passed away a few weeks ago and her funeral was on the weekend. I inherited one of the bangles, my aunts and mother got others. It is nice to have this daily reminder of her always within view. Thanks for this story. We’re Jamaican. I remember getting little tiny ones as a baby. Good to know how to take it on and off. Ashley, I’m so sorry for your loss. Thank you for sharing your story with me. What a precious thing to hold on to! Loved this story about family heirlooms and tracing their origins!